1. Report the incident to your local police station and FBI office IMMEDIATELY. 3. You do not have to permit them to enter your home. … ALWAYS have an attorney present when answering questions. Here is an abbreviated version of an undated "Know Your Rights!" flyer that CAIR's New York office made available on its website in December 2002. In response to the question, "What should I do if agents come to question me?" it counsels Muslims offer the least help possible. 1. You do not have to talk to the police, FBI, INS, or any other law enforcement agent or investigator. 8. If you are nervous about simply refusing to talk, tell them to contact your lawyer. Nor is CAIR alone in this obstructionist attitude. Brandon Mayfield, the Oregon lawyer wrongly jailed as a material witness in May 2004, yesterday advised a meeting of the Islamic Society of North America, "Just say no to the FBI" if agents asked questions. July 5, 2004 update: The Muslim Public Affairs Council has came up with a more subtle idea. 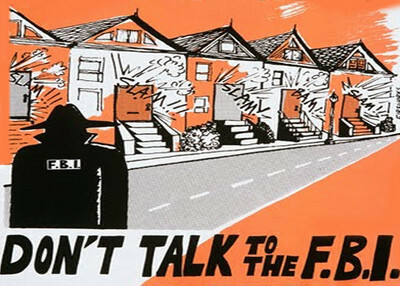 Rather than counsel Muslims "You have no obligation to talk to the FBI," it is instead suggesting to the FBI, as paraphrased by the Los Angeles Times, that "meeting with community groups can be more productive than targeting individuals." Meeting with a group, of course, eliminates almost any chance of pursuing a counterterrorist line of inquiry and so defeats the purpose of the interviews, but does so more elegantly. July 14, 2004 update: Wissam Nasr, executive director of CAIR's New York office, confirms his organization's skewed view of law enforcement: "The Muslim community in New York wants to play a positive role in protecting our nation's security," he said in a CAIR press release today, "but that role is made more difficult if the FBI is perceived as pursuing suspects much more actively than it is searching for community partners." But "pursuing suspects" is what the FBI is supposed to do! This bizarre statement implies that the FBI should get out of the unpleasant business of law enforcement and instead devote itself to building communal good will. How convenient for the forces of militant Islam, no? June 27, 2005 update: CAIR sponsored an event for women in Lodi, California, on June 25. Titled "Know Your Rights," it featured two female attorneys, Marwa Elzankaly and Nancy Hormachea, advising a dozen women at the Boys and Girls Club how to stiff the FBI. Don't talk to agents without a lawyer. "It's perfectly OK to say, 'I'm sorry, I don't feel comfortable talking to you,' and close the door." Take notes if agents arrive with a warrant. Don't offer any information; for anyone detained on immigration violations, "it's so important just to try not to talk, because then the government has to prove that you're not here legally." Nov. 6, 2006 update: The Bishop of Rochester, Michael Nazir-Ali, captured this duality today, speaking of Muslims: "Their complaint often boils down to the position that it is always right to intervene when Muslims are victims, as in Bosnia or Kosovo, and always wrong when the Muslims are the oppressors or terrorists, as with the Taleban or in Iraq." Aug. 12, 2010 update: MEMRI focuses on this subject at "American Muslim Jurist to Muslims: Don't Work for the FBI." Sep. 30, 2010 update: The Investigative Project on Terrorism looks at "MPAC's One-Way Street on Cooperation." Jan. 13, 2011 update: The Investigative Project on Terrorism makes mincemeat of CAIR's new inconsistencies vis-à-vis law enforcement today. For starters, see CAIR's eye-opening graphic, below. CAIR Can Expel You "For Any Reason"